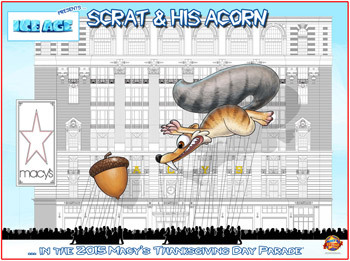 NEW YORK (Oct. 22, 2015)  The acorn-loving movie star "Scrat" from the Ice Age film franchise will make his debut as a giant balloon in the 89th Annual Macy's Thanksgiving Day Parade on November 26. The whimsical two-balloon design features Scrat chasing an acorn just beyond his reach. Scrat will measure approximately 59-feet long, 24-feet wide and 41-feet tall, while the giant acorn measures 21-feet tall. It would be quite a treat if Scrat were ever to catch up, as it would take more than 15 million real acorns to fill Scrat's helium version. 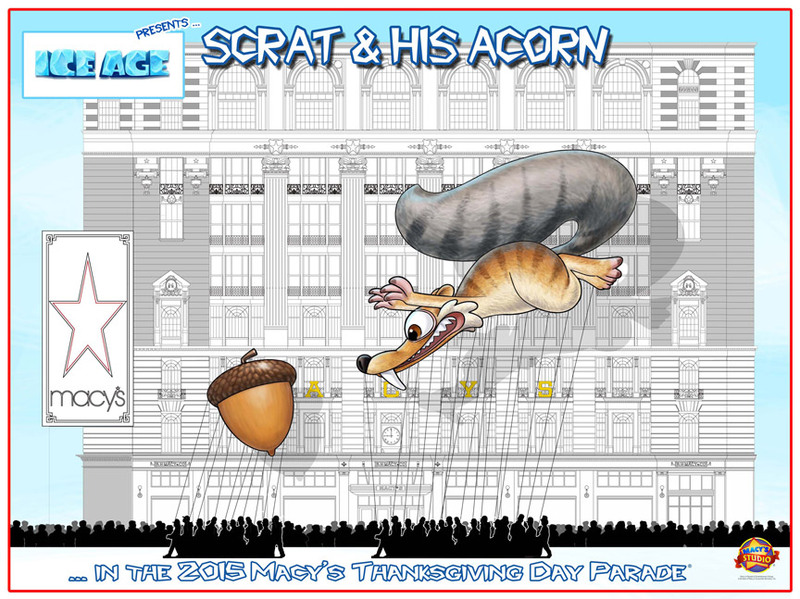 "We can't think of a better way to celebrate a global icon such as Scrat than immortalizing him in one of the most beloved and cherished American events, the Macy's Thanksgiving Day Parade," said Zachary Eller, senior vice president of marketing partnerships at 20th Century Fox. "From the moment we began discussing a way for our Ice Age herd to participate, we knew that Scrat chasing that just out-of-reach acorn was the only possible idea!" The Macy's team is excited to be adding the new character to the parade's lineup. "Ice Age's rambunctious Scrat is sure to be a giant balloon fans of all ages will go nuts for!" said Amy Kule, executive producer of Macy's Thanksgiving Day Parade. "Our team and millions of Ice Age fans lining the streets of New York City and in homes across the country will be cheering Scrat on as we wait to see if he catches the ultimate treat on Thanksgiving Day." The 89th Annual Macy's Thanksgiving Day Parade airs nationwide on NBC-TV, on Thursday, November 26 from 9:00 a.m. to Noon in all time zones. Twentieth Century Fox Pictures/Blue Sky Studios "Ice Age: Collision Course" will be released worldwide in Summer 2016. About the Macy's Thanksgiving Day Parade: With more than 50 million viewers across the country and more than 3.5 million spectators along the streets of New York City each year, the Macy's Thanksgiving Day Parade is a national icon that has grown into a world-famous holiday event. Growing in size and scale, the parade proudly marches down a more than 2- mile route in New York City with more than 8,000 participants in tow including Macy's employees, their families, celebrities, athletes, clowns and dance groups spreading holiday cheer. The parade also features America's best marching bands, fabulous floats and Macy's signature giant helium character balloons. For more information on the Macy's Parade please visit social.macys.com/parade or call the Parade hotline at (212) 494-4495. Source material courtesy of Macy's.